I am running Finale 2012 on OS 10.7.4 and am having trouble figuring out how to remove an unwanted mid-staff instrument change. I've tried utilities=>change instrument and no luck. The beginning measures are trumpet and then at measure 25 it changes. The piece started as an arrangement for a different instrument set, but all of the other staves and the beginning of this one have changed instruments correctly. Can anyone point me in the right direction to figure out what I might be doing incorrectly.......... 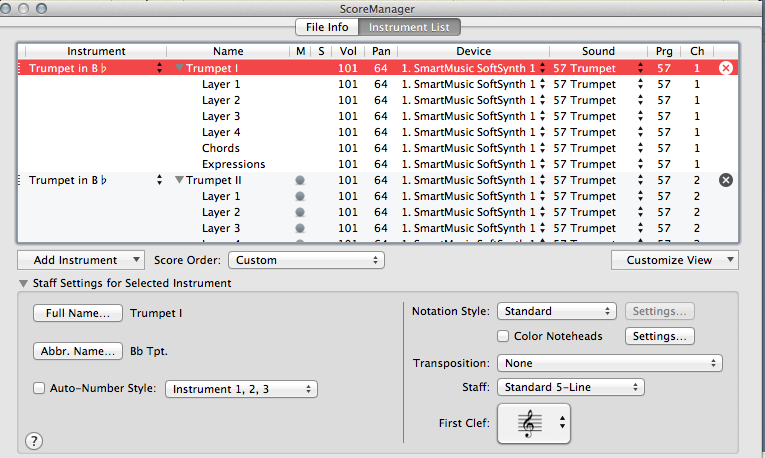 I've attached a screen print of the settings shown in score manager. This image has been viewed 88 time(s). I don't see the change in your screen shot. However, there is a column that has an x and a measure number next to it. Click the x next to the measure number (25 in your example) and the change will disappear. Thanks for the fast reply - I really appreciate it! Since the screen shot doesn't show a mid staff change, maybe there isn't one. Can we see the actual Finale file? This file has been downloaded 182 time(s). Is this a file you created yourself, or a MIDI file brought into Finale? You have a MIDI instrument change in bar 3. I deleted that and all is well. This file has been downloaded 185 time(s). awesome! Thanks for finding that! How do I remove it? There are different ways. It depends on whether any of the MIDI data is needed in the file. Did you put that data there? Is this an imported MIDI file? This is part of the info needed. Are you new to Finale? Oh Zuill, I'm so sorry. Yes, I am new to Finale. The Midi data isn't needed and yes, it is imported. I'm reading the manuals as quickly as I can, but not fast enough. For the attached file, I went to the MIDI tool, selected Continuous Data and chose Patch Change. I then highlighted the staff and chose the Clear item in the MIDI menu. Perfect. Worked like a charm. Thank you again for the help and your patience!